History tells us that Dao An was a famous Buddhist monk who had a very highly knowledgeable about Buddhism. However, we cannot find any trace that relates him to Dayan Qigong. Maybe he did develop Dayan Qigong and it was never recorded, throughout history things like this can happen. 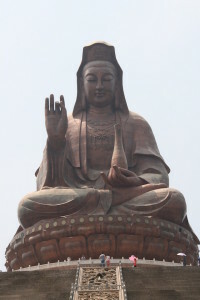 Dao An did translate a lot of Buddhist sutras and understood Buddhism very deeply. Dayan Qigong uses a lot of Daoist knowledge, but its principles and at its heart, it is Buddhist as well. To Chinese culture, Buddhism and Daoism are both very important and I cannot tell you which one is better as they both teach us to be a better person, to have a good heart. Then you have these things you will become healthier and live a good life. When practising Dayan Qigong we need to empty our mind and think of nothing. This is the principle of Buddhism and Daoism. “Emptiness” and “Nothing” are the same thing. During the many years studying with my teacher, Grandmaster Yang Meijun楊梅君, she would always pay respect to Buddha, Guan Yin觀音 and Lao Zi老子 . This is the spiritual side of the Dayan Qigong system. Dao An is the founder of Dayan Qigong System that what we were told, that what we should respect.